○ Exclude some specific sub-folders. ○ Exclude all the sub-folders that contains or equals to a sub-string. ○ Exclude or include specific file types (extension patterns). ○ Filter files by timestamp (files changed after specific time). ○ Save the copying task for later use (Or run it by schedule). It is free for copying local folders by BestSync! 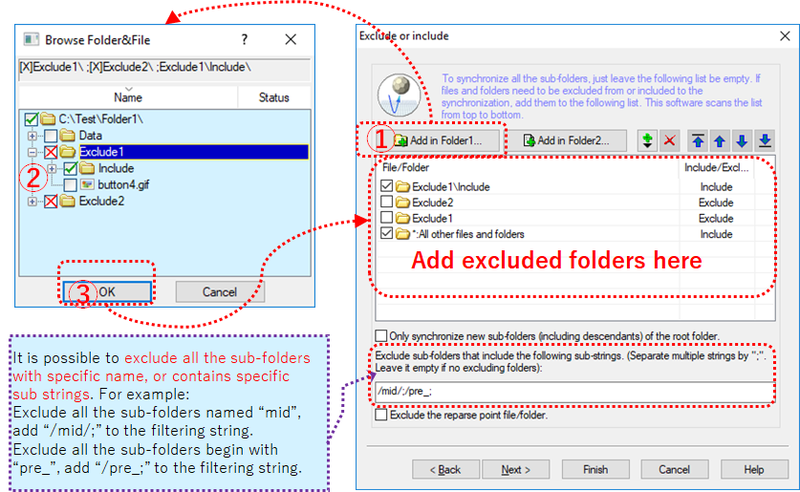 Here is a sample of how to exclude sub-folders and file types from the copying object. Add a new task, the "General" wizard page is shown. Press the "Folder Browser" buttons to select a source folder, and the target folder. 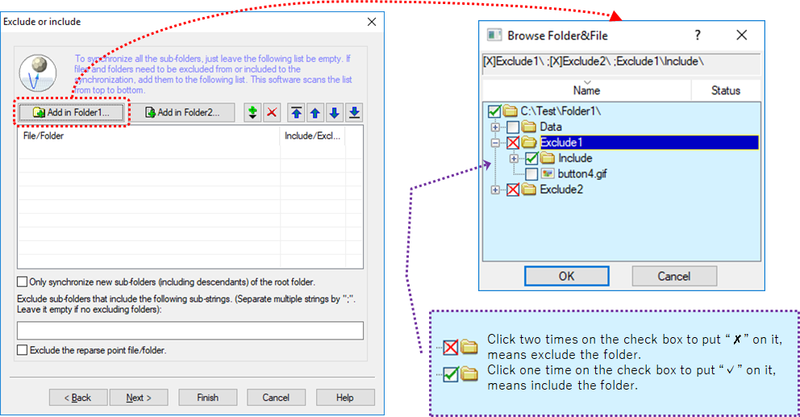 In the "Exclude or include" wizard page, press the "Add Folder1..." or "Add Folder2..." button to select folders that you want to exclude. In the "Browse Folder&File" dialogbox, click two times on the check box to put “✗”(cross mark) on it, means exclude the folder. Click one time on the check box to put “✓”(check mark) on it, means include the folder. Exclude all the sub-folders named “ mid ”, add “ /mid/; ” to the filtering string. Exclude all the sub-folders begin with “pre_”, add “/pre_;” to the filtering string. In the "Filter" wizard page, you can edit the file type filtering patterns, or press the "Type Browser" button to select the file types. Also you can select to include or exclude the file types. 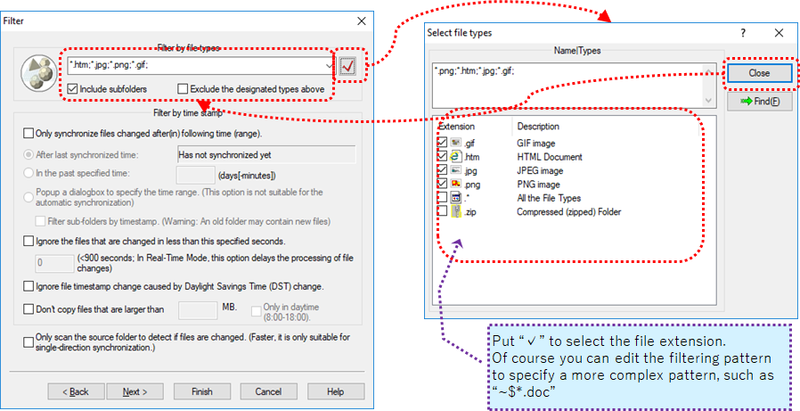 In the "Filter" wizard page, you can select options to filter file by it timestamp. Such as, copy only files changed in the last 7 days. 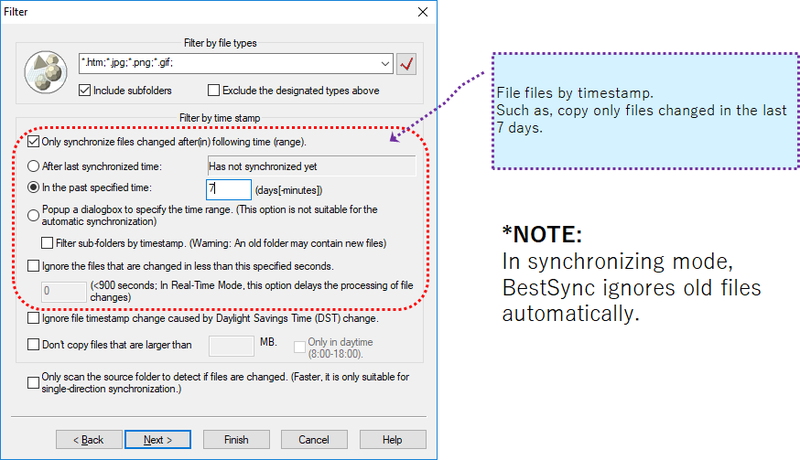 *NOTE: In synchronizing mode, BestSync ignores old files automatically. BestSync will not copy old files again and again. After the synchronizing task is setup, it is added to the task list. You can start it whenever you want to copy the changed files.